MoonMarble.com - Iridized Opal White 5/8"
Bulk Marbles → Target Marbles - approx. 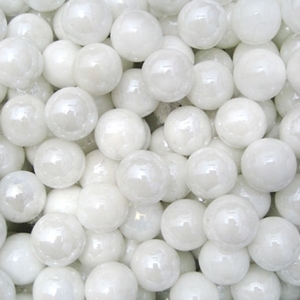 16mm or 5/8" → Solid Colored Game Marbles - 5/8" → Iridized Opal White 5/8"
These solid white marbles are a common colored marble used in games such as Wahoo or Chinese Checkers. They are iridized to have an extremely shiny, reflective surface. They are sold by the pound with approximately 80 - 90 marbles in a pound. Sizes may vary slightly. Warning! : Choking Hazard. This toy is a marble. Not recommended for children under 5 years. Assorted - Game Marbles 5/8"